You can’t talk about Bingham County Idaho without talking potatoes. Simply put, there is no finer potato grown anywhere in the world than the Idaho Russet, and more of them are grown in Bingham County than anywhere in the world. They grow a lot of them, 30% of the United States production of Potatoes are grown here. 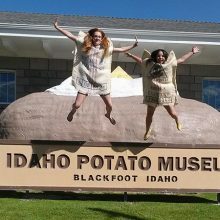 Since this is potato country you should make you first stop the Idaho Potato Museum on Main street. The Idaho Potato Museum is all about potatoes. You’ll learn how they’re planted, how they grow, how they are harvested, and the many ways they are cooked. Don’t get the idea this is all serious stuff, you’ll also get to see the world’s largest potato chip and a Marilyn Monroe exhibit featuring the movie star filling a burlap potato sack like no russet ever did. The museum is open from May through September and offers an additional incentive to out of state visitors; you get a free baked potato with your paid admission. Growing that many potatoes uses up a lot of land, but somehow Bingham County has some left over for sportsmen, play, and three communities that will win your heart. If you are headed north your first stop will be Blackfoot. Blackfoot is at the confluence of the larger and better known Snake River and the Blackfoot River from which it gets it’s name. 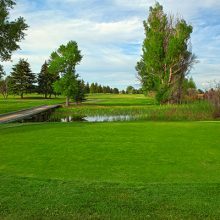 Blackfoot loves parks and has 10 of them, the biggest is Jensen Grove right off Interstate 15. 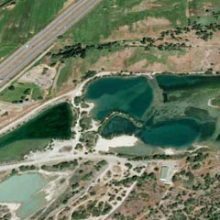 The 20 acre Jensen Lake provides swimming, water skiing and personal watercraft opportunities. 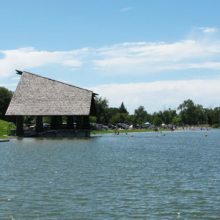 The park contains part of a Greenway system which links the community of Blackfoot with the Snake River, part of the path crossing over the north end of Jensen Lake. Then there is the Eastern Idaho State Fair. That’s the official title. It is in fact one of the finest agricultural fairs in the country. Starting Labor Day weekend and running through the following Saturday, this fair will draw over 200,000 visitors to the town of 10,000. You’ll find the expected exhibits along with pari-mutuel horse racing, rodeos, carnival rides of course, and big name entertainment every night. In addition, two small stages on each end of the fair grounds offer free entertainment acts daily. At Interstate 15’s milepost 98, have a look at the peaked building with the sod roof. That’s a potato cellar. This part of Idaho is full of them and they are nature’s most efficient system for storing the crop. To the right of it you’ll see a more modern version, but these sod covered versions are original and still serviceable. Now’s the time to head for the Snake River again, especially if you’re making your trek in an RV. You are looking for what’s called North Bingham County Park. It’s the newest park in the Bingham County system and offers RV hookups and dump station and a picnic area to let you enjoy the view of one of the country’s most attractive rivers. This area also features a Greenway linking the town of Shelley and the Snake River, near the park it runs adjacent to the river to make stretching your legs a scenic event. Then there’s Aberdeen. 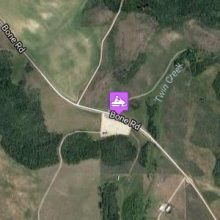 Aberdeen is south of Shelley, and west of Blackfoot. Take State Highway 39 to get there because the trip is worth it. In addition to the surrounding potato country, Aberdeen is near the shore of the American Falls Reservoir. There’s more information on the Reservoir in the American Falls section of this travel guide. You’ll want to check out Sportsman Park for its access to the reservoir and complete services for RV travelers and fishermen. 18 hole championship golf course designed by George Von Elm, 1926 US amateur champ. 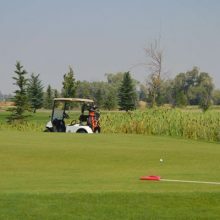 9-hole golf course located in Shelley, Idaho. There is a two mile paved walking path surrounding Jensen Lake, with 55 acres of water for many summer activities, including swimming, boating, and jet skiing. An historic collection of classic dolls and Native American artifacts graces the interior of this mansion museum. Guided tours. 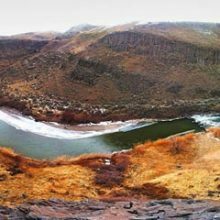 The Blackfoot River Canyon is a smaller version of the Snake River Birds of Prey Area and makes for an excellent backcountry scenic drive. The Blackfoot River offers good whitewater boating and wildlife viewing opportunities. A backcountry drive meanders along the rim of the gorge and offers views into the canyon and river below. 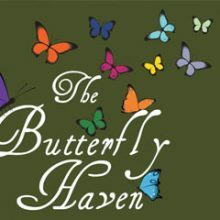 Visit Idaho’s largest butterfly house where you can enjoy the beauty of many different species of butterflies, plants and birds. Showcasing many different species found here in Idaho. Walk through the indoor botanical garden and watch the butterflies flutter around you. The 40-acre sportsmen’s access site for fishing, and features outdoor and indoor archery courses. 10-mile trail connects with Jensen’s Grove. 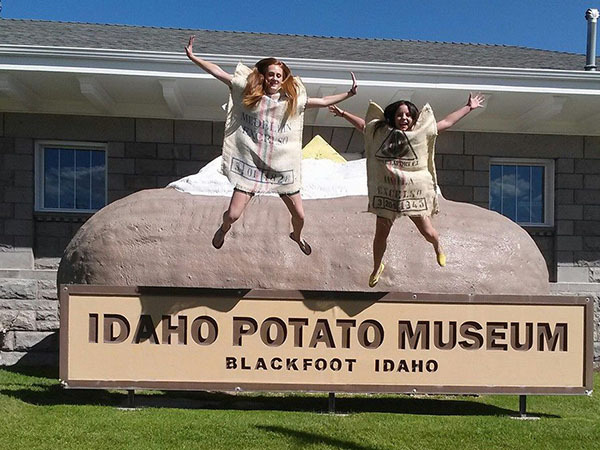 The Idaho Potato Museum celebrates the humble spud and its contribution to humanity. 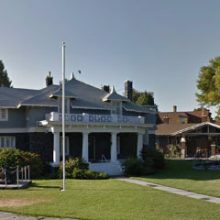 Located in Blackfoot, Idaho, the Potato Capitol of the World, the Idaho Potato Museum explores the history, cultivation and harvesting of potatoes. Displays showcase unique artifacts including the World’s Largest Potato Crisp, as noted in the Book of Guinness World Records. Visitors can take their photo with the museum’s giant baked potato! The museum’s gift shop offers a wide variety of potato and Idaho-themed gifts. No visit to the museum is complete without a visit to its Potato Station Café! Hot baked potatoes and homestyle French fries are featured on the menu!